Hi everyone and welcome to realrecipe. Today I’m sharing with you how to make easy pizza dough recipe . Making homemade pizza’s is one of my favourite things to do, it’s a lot of fun, and you can be really creative with the toppings. It’s also very easy, so if you would like to learn how to make your own pizza dough then just keep on reading. This first thing we need to do is wake up the yeast. I’m using activated dry yeast, but you could use fresh yeast if you have some. Pour warm water into a bowl, followed by the yeast. You don’t want the water to be too hot or too cold because either can effect the yeast. Mix together and leave for about 10-20 minutes while we prepare the remaining ingredients. In a mixing bowl measure out 2 cups of strong flour, or bread flour. 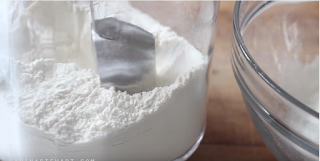 This flour has more gluten in it than standard flour or cake flour, which is needed to make bread. Add in thesalt and sugar and mix together with a spoon. Create a well in the middle for pouring in the wet ingredients. Measure out the olive oil and pour into the well made by the flour, followed by the yeast17 mixture. It should be frothy at the top, if it isn’t leave it for a bit longer. Start to mix the dough with a butter knife, it works a lot better than a spoon as it cuts through the dough. Once it has come together enough you can scrape any dough off the knife and start to use your hands. 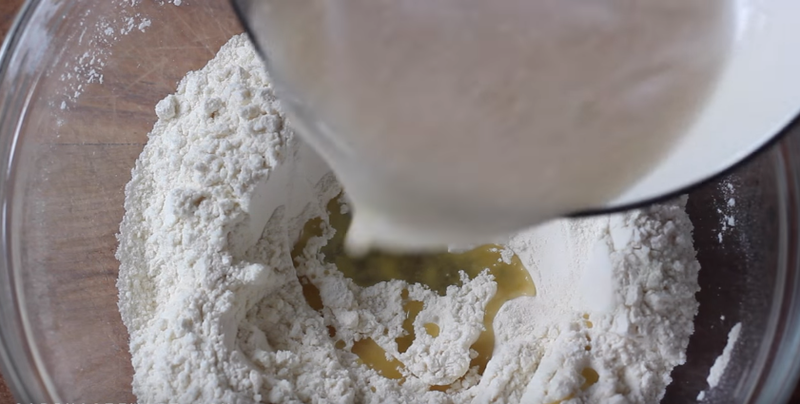 Pour it out onto a surface and start to knead. You may find the dough seems too wet or too dry at this point but don’t add anything. Continue to knead until the dough starts to smooth out. If it is still sticking to the bench sprinkle a touch of flour over the dough. 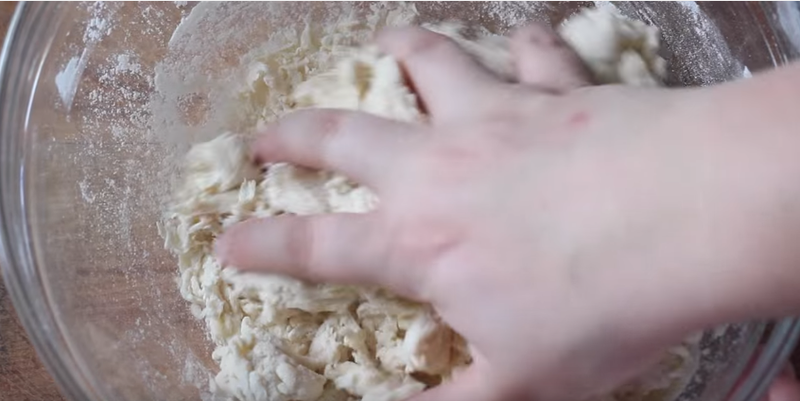 In total this has to be kneaded for 10 minutes to work out the gluten, other wise you would be left with a flat and tough pizza base. Everyone has a different style to kneading but essentially what you need to do it fold and push out the dough with your hands. The more you do it the easier it is. Once the dough has become smooth and elastic it’s ready to be left to prove. 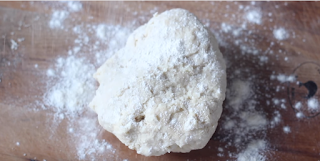 Shape the dough into a ball, pinching the bottom together. Pour a small amount of oil into a bowl and spread it over the dough, Cover with plastic wrap and leave in a warm draft free place until it has doubled or tripled in size. There is no exact time that you need to leave it for, depending on the temperature it may prove faster or slower so just give it time. Alternatively you can use a bread maker , When your dough has doubled in size remove the plastic wrap and punch it back to remove the air. enough to knock most of the air out of it. Then begin to shape it. This dough will make two large pizza’s or three medium sized depending on how thick you like the crust. 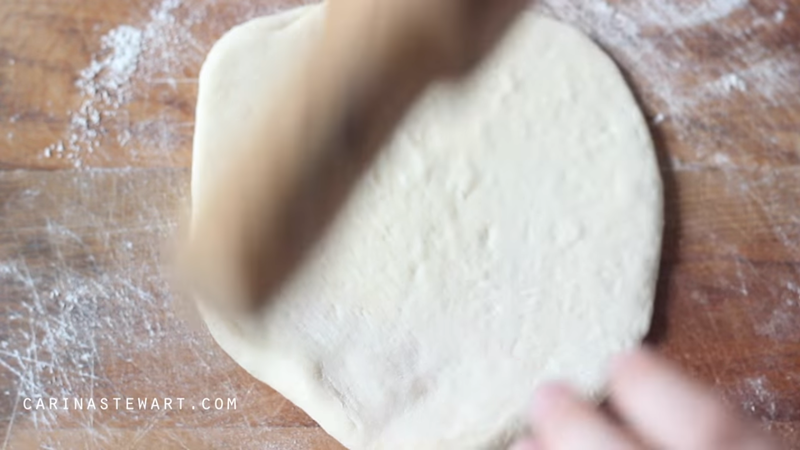 Bake the pizza on the highest temperature your oven will go to on a pizza stone if possible. 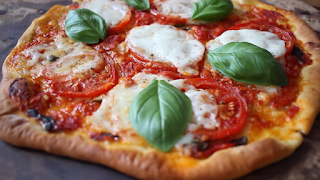 Remove it from the oven when the pizza base has risen and browned and toppings are cooked. I hope you found this Post helpful and it’s inspired you to make your own pizza Easy pizza dough recipe.